Gotham is beginning production on its fifth and final season this week, but fans who attended San Diego Comic-Con over the last few days got the first glimpse of what's to come when the Batman prequel returns in 2019. Each and every year, everyone who checks in to Comic-Con gets a massive tote bag/backpack, which is covered with art from an ongoing, or upcoming, movie or TV series. Warner Bros. has provided the faces of these bags for some time, and this year was no different. Ranging from Supernatural, to Aquaman, to DC's Super Hero Girls, these bags boasted key art from all sorts of projects. Come to find out, this included a look at Gotham's final season as well. While it wasn't advertised ahead of time, one of the bag designs featured key art from Gotham Season 5, teasing the mass destruction that's still to come. You can check out a photo of the bag below! 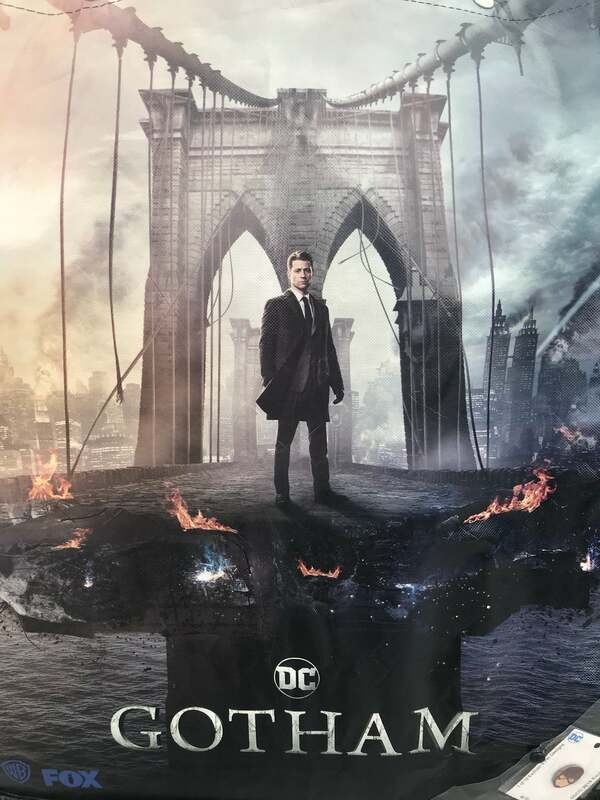 The art features Jim Gordon (Ben McKenzie) standing on the edge of one of the bridges into Gotham City that was destroyed in the Season 4 finale. The bridge is still burning from Jeremiah's explosions. Almost the entire cityscape behind Gordon is teasing a Gotham in ruins. Fire and smoke rises from most of the buildings, and the city itself is in absolute shambles, which was expected given the "No Man's Land" story that's still to come. However, taking a page from other iterations of The Dark Knight, there is some hopeful symbolism in the image. A "night is darkest just before the dawn," sort of moment. In the back right corner of the art, you can see a spotlight shining through the smoke and into the night sky. It may not have the logo of a bat inside it, but make no mistake, that's the signal that Jim revealed to Bruce at the end of Season 4. It's the signal that means heroes still exist in Gotham City, that there is still hope to be had, no matter how bad things have become. It's the signal that will one day tell Batman that someone needs his help, sending the Caped Crusader to the rescue once again. What do you think of the new Gotham key art? Are you looking forward to Season 5? Let us know by dropping a line in the comments! The fifth and final season of Gotham is set to air on FOX in 2019.